Alexander A. Schomburg, born Alejandro Schomburg y Rosa (/ˈʃɒmbɜːrɡ/; May 10, 1905 – April 7, 1998), was an American commercial artist and comic-book artist and painter whose career lasted over 70 years. Alex Schomburg was born on May 10, 1905, in Aguadilla, Puerto Rico, and moved to New York City in the early 1920s, where he began work as a commercial artist with three of his brothers. In 1928, the brothers' partnership ended and Schomburg found work with the National Screen Service, creating lantern slides and working on movie trailers there through 1944. During the 1930s, in addition to working for the NSS, Schomburg freelanced Better Publications, producing interior line art for Thrilling Wonder Stories and others of the company's pulp magazines. His skill at drawing anything mechanical soon had him illustrating aviation covers for Flying Aces and electronic equipment for the Hugo Gernsback pulp Radio Craft. 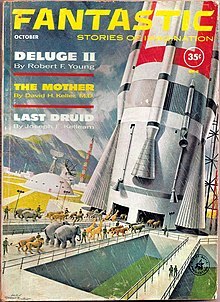 Schomburg's first science fiction-themed cover was for the September 1939 issue of Startling Stories. As the artist recalled in 1939, "One day the publisher asked me to do an illustration for Thrilling Wonder Stories. I had always been interested in science fiction and they liked the way I handled the art work. I enjoy reading the story as much as doing the illustrations. In my opinion an illustration is very important. For instance, give the same story to two different persons ... then ask them to picture a certain scene. You can bet they'll be entirely different." The following decade, Schomburg freelanced primarily for Timely Comics, the 1940s forerunner of Marvel, displaying his talent for action tableaux in covers featuring Captain America, the Sub-Mariner, the Human Torch, and other superheroes. His first recorded comic-book work is two covers released the same month, for Daring Mystery Comics #1 and Marvel Mystery Comics #3 (both cover-dated Jan. 1940). Schomburg would draw most of the companies covers, as well as a smattering of single-page interior illustrations, through Marvel Mystery Comics #76 (Sept. 1946). He also provided covers for Pines Publications, for titles including Exciting Comics and America's Best Comics, featuring such superheroes as the Black Terror and the Fighting Yank, as well as for Harvey Comics, including the licensed radio-series crimefighter star of Green Hornet Comics. On some Pines comics from 1947 to 1949, he signed covers "Xela". In the early 1950s, Schomburg left comics and spent the remainder of his career on covers and illustrations for science fiction magazines, astrology publications, and books, including the Winston juvenile series. In 1977, Schomburg and a few of his fellow Golden Age comic book artists collaborated on the Invaders Annual #1, written by Roy Thomas. Schomburg penciled and inked a six-page chapter featuring the Golden Age Human Torch. Late in life, Schomburg resided in Hillsboro, Oregon, and died in Beaverton, Oregon, on April 7, 1998. I've always felt that Alex Schomburg was to comic books what Norman Rockwell was to The Saturday Evening Post. He was totally unique, with an amazing distinctive style. You could never mistake a Schomburg cover for any other artist's. ... I remember hearing Timely Comics publisher Martin Goodman tell me time and again how great a cover illustrator Alex was, and how he wished we had more like him. ... [D]espite the quantity of work we gave him, despite the care and effort that went into every Schomburg cover, I cannot remember Alex ever being late with any illustration. ^ a b Alexander A Schomburg at the United States Social Security Death Index via FamilySearch.org. Retrieved March 4, 2013. ^ a b Alejandro Schomburg Y Rosa at Puerto Rico Civil Registration via FamilySearch.org. Retrieved on March 21, 2015. Note: Pulp historian David Saunders (cite below) gives name as Antonio Alejandro Schomburg. ^ "Meet Our Science Fiction Family > Alex Schomburg". Thrilling Wonder Stories. 13 (3). Better Publications. June 1939. p. 87. ^ a b c Alex Schomburg at the Grand Comics Database. ^ a b "The Alex Schomburg Checklist at LiveForEverett.com. Archived from the original on July, 23, 2008. ^ "Xela" at the Grand Comics Database. ^ Saunders, David (2009). "Alex Schomburg (1905-1998)". PulpArtists.com. Archived from the original on June 21, 2014. Retrieved March 22, 2015. ^ Lee, Stan. "Full text written by Stan Lee ... about Alex Schomburg". The Official Estate of Alex Schomburg. Archived from the original on February 5, 2015. Retrieved March 22, 2015. Gustafson, Jon, ed. (1986). Chroma: The Art of Alex Schomburg. Poughkeepsie, New York: Father Tree Press. Wikimedia Commons has media related to Alex Schomburg. The Official Estate of Alex Schomburg. Archived from the original on December 16, 2014. Duin, Steve (December 1993). "Golden Age Great: Alex Schomburg". Overstreet's Golden Age Quarterly. Reprinted at LiveForEverett.com (2). Archived from the original on July 17, 2006. "The Alex Schomburg Checklist". Archived from the original on February 7, 2006.